The following is the text of a talk I gave yesterday (19.5.18) at an event at the home of Sir Oliver Wardrop, the first British high commissioner for the Transcaucasus, to mark the 100th anniversary of Georgian independence. 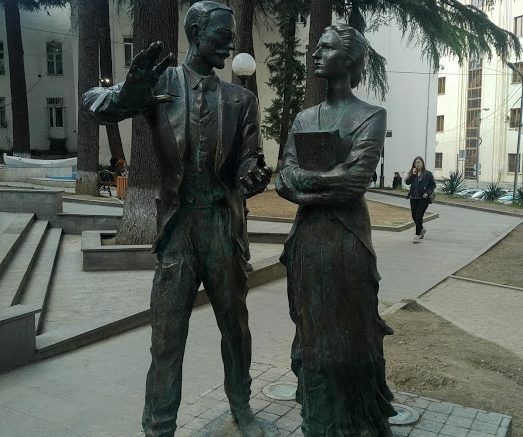 In the picture: the recently-erected statue of Sir Oliver and his sister Marjory in Tbilisi. I’d like to focus my talk on the myths and the reality of Georgia’s relationship to the West during the period of the first republic, from 1918 to 1921, and conclude with some observations about where we stand today, and what I think we must be doing. 1 The Georgians were tools of imperialism, specifically of German imperialism at first, and then following the German defeat in the first world war, they were tools of British imperialism. 2 The Georgian Mensheviks, because of their supposed hatred for Bolshevism, actively supported the Whites in the Russian Civil War. Had those myths been true, the Soviets would have been entirely right to invade Georgia and put an end to their anti-Soviet and pro-imperialist behaviour. But they were not true. They were made up. They were myths. Where did those myths come from? There were pro-Soviet publications at the time, and later, which spread both myths, including publications which were translated into English. For example, a book by one J. Shaphir entitled Secrets of Menshevik Georgia: The plot against Soviet Russia unmasked, which was published by the Communist Party of Great Britain in 1922. You can read it in the British Library, as I did. Shaphir’s books purports to prove these myths this using captured documents and statements of the Menshevik leaders themselves. It is not a convincing book now, and it was not convincing in 1922 either. But ironically, the main source of these myths, and the reason why they persist today, at least in the West, was Leon Trotsky. Because though he was the head of the Workers’ and Peasant’s Red Army, he knew nothing about the Soviet invasion of Georgia until after it had begun. “By whose order”? Trotsky admitted that it was not his order, that he knew nothing about the invasion, which was a major military operation involving several Soviet armies. Not only did he not know about this, but the invasion appears to have been ordered by his arch-enemy and eventual executioner, Stalin, working in secret with his cronies. Trotsky wrote an entire book, Between Red and White, in which he “exposed” the Mensheviks for their various crimes, the main ones being the collusion with Western imperialism and the White armies. It was a far better book than Shaphir’s, and reached a much larger audience, and incredibly, was still in print a few years ago. If only we had access to those British archives, he seemed to be saying, we could know the true story of Menshevik Georgia. But today, nearly a century later, we actually do have access to those archives and can begin to reconstruct the real relationship between the Georgians and the foreign powers. It is one that bears little resemblance to the one Trotsky described, in which the Georgian Social Democrats were tools of the imperialists and actively engaged in the Russian Civil War on the side of the Whites. Why did Trotsky spread these myths? I believe this was because of his loyalty to Lenin and the Bolshevik party, and the strange discipline of “democratic centralism” according to which every Party member must publicly defend decisions taken by the party, even if they disagree with them. These myths about the relationship between Georgia and the West lasted through nearly seven decades of Soviet rule. Entire generations in Georgia were told these stories. Whether they believed these stories is another matter, but officially there was no other story to be told. Even now, even here in the UK, many people on the far left know only this story, and believe these myths to be true. For example, last year I debated a British Leftist group on the subject of the 1917 revolutions. I made a casual reference to the Georgian experiment, which was not at all central to our debate. My opponent, who knew that I’d just completed writing my book, came prepared to challenge me on this issue. He had dug up a copy of Trotsky’s Betweeen Red and White, and quoted the assertions of Georgian complicity with imperialism and its support for Denikin. It was the only book on Georgia he ever read. I’d like to speak now about the reality of the Georgian relationship with the West in the years of the first republic. Let’s start with the German occupation in 1918. Trotsky and other Communists portrayed this as the Mensheviks grovelling before foreign imperialism. But that completely ignored what actually happened. The central fact in the spring of 1918, the main challenge facing the Georgian leadership, was the imminent Ottoman Turkish invasion of their country. With the collapse of the Russian army on all fronts, and the first world war still raging, it was inevitable that Turkis forces would surge into the Caucasus, just as German forces moved into Ukraine and other parts of the collapsing Russian empire. To thwart that imminent Turkish invasion, the Georgians came up with a master-stroke: they went behind the backs of the Turks. They secretly went to Turkey’s senior partner in the Central Powers, their ally and benefactor in the world war — Germany. Georgia did not have the capacity to stop the Turkish army. But the Germans could give the order to the Turks to back off. And that is what happened. The Georgians made a deal with Germany that prevented a Turkish invasion, kept their sovereignty, and allowed the young republic to survive. By all accounts, the Germans played the role that had been agreed for them. Under German protection, Georgia remained a sovereign state. The Germans were not enthusiastic about the Social Democratic programme, but did nothing to stop the historic land reform and other changes which Noe Zhordania and his comrades brought about. When Karl Kautsky visited Georgia in 1920, he learned from the Georgians more details about the German occupation. Kautsky was no friend of German militarism and the Kaiser’s regime. He was an outspoken opponent of the first world war, and even broke from the Social Democratic Party over its refusal to fight against the war. But he wrote in his short book about Georgia that the German occupation was actually something to be proud of, that the Germans had helped a small, young nation get on its feet again. This was not about the treasonous, cowardly, pro-imperialist Menshevik leaders pandering to their imperialist lords. It was a master-class in diplomacy, turning one ally (Germany) against another (Turkey) and thereby ensuring the survival of the Georgian republic. The British occupation of Georgia later in 1918 was an entirely different story. While the Georgian leaders had invited the Germans in to their country, the British invited themselves in. They had won the war, the German forces needed to be sent home, and it was only natural that British troops arrive in Georgia to assert their authority. Unlike the Germans, the British soldiers who arrived did not fully grasp that Georgia was a sovereign republic. The first meeting between the Georgian leader, Noe Zhordania, and a British officer was not a good one. Zhordania essentially told the British officer to show some respect and get out. The officer, to his credit, came back later that day and apologised. The occupation had gotten off on the wrong foot. The main cause of tensions between the British and the Georgians was British support for the armies fighting to overthrow the Bolshevik regime in Russia. This was the main priority of British foreign policy in the region at that time. Georgia was a sideshow. Despite what Trotsky wrote, the Georgians had declared their neutrality and were serious about it. They had no interest in backing any side in the Russian Civil War. Both sides — the Whites and the Reds — appealed for Georgia to come on board, and to support their war effort. But the Georgians refused and instead they did what they could to defend their borders, initially from the threat of a White invasion from the north. Clashes between General Denikin’s White forces and Georgian troops took place. And British officers on the scene were appalled at the Georgian behaviour. They expected the Georgians to take the British side, that is to say, the White side, in the Russian Civil War. At one point, British officers in the region sent a wire to London asking for permission for the Royal Navy to bombard Georgian forces if they continued to clash with Denikin’s forces. That’s the kind of document you find today in the National Archives in Kew, where I did the research for my book. Trotsky expected that once those secret documents became available, you’d find evidence of collusion between the Georgians, the British and Denikin. Instead, what you find is a far more complicated picture, one in which the Georgians are remaining neutral, doing all they can to preserve their independence and to stay out of the Russian conflict. Which brings us to Oliver Wardrop. When relations between the Georgians and British were at an all-time low, when the possibility of armed clashes between British and Georgian forces were a real possibility, the British government decided to send Wardrop to Tbilisi. Wardrop was the right man — indeed, the only man — for the job. His arrival not only averted catastrophe, but completely changed the relationship between the two countries. It is entirely due to him that Britain and Georgia became friends and have remained friends for a century. I want to conclude by looking at some lessons of all this, and we can do about this today. First of all, it’s vitally important that we win the battle for historical memory. The real story of the first Georgian republic needs to be told. It needs to be told in Georgia itself, so that a new generation of Georgians learns about a time when their country was seen by many European social democrats as a great experiment. But it also needs to be told outside of Georgia, because the Georgian Social Democrats proved that another revolution was possible. They proved that the Bolshevik road to socialism, which led to the totalitarian nightmare of Stalinism, was not the only road. There were other choices Social Democrats could make, and the Georgian Social Democrats chose democracy and human rights. The Georgian experiment also has lessons to teach us today on the defence and diplomatic front. The first Georgian republic worked round the clock to win recognition from the Great Powers, and to a certain extent they succeeded. The current Georgian republic has had that recognition for some time now. But it needs, as the first republic did, more than just diplomatic recognition. Georgia alone cannot defend itself against aggression by its neighbours, in particular aggression by Russia, as we saw a decade ago. Georgia needs to be a full member of NATO as soon as possible to ensure its security. But I would also argue that NATO needs Georgia, and not only because of the contribution Georgia already makes to global security with its mission in Afghanistan and more. Georgia sits on the borders of an increasingly aggressive Russia, one that needs to be restrained and contained. That is what NATO has done so well since it was founded in April 1949. No NATO country has ever been invaded by Russia, though Russia has sent troops into many countries in those nearly 70 years, including Hungary, Czechoslovakia, Afghanistan and most recently, Georgia and Ukraine. Those countries were all vulnerable because they were not part of the Atlantic alliance. NATO has proven to be a great success in the sense that the Russians do recognise that NATO membership means something, and they are reluctant to test NATO’s resolve. That’s why NATO needs to embrace democratic countries like Georgia which sit on the Russian borders, in order to draw a line — and say to the Putin regime: no more. We who live in countries which are NATO members must do all we can to remove the obstacles to full Georgian membership of the alliance. I want to end by suggesting that in this centenary year, when Georgia celebrates the achievements of its first republic, that we do all we can to raise awareness of those achievements around the world. Georgia was not a perfect society from 1918-1921, but it was a great attempt to create a better, more just society. A society that was democratic, respected human rights, gave the vote to women and tolerated difference. Georgia will, I hope, continue on the path set out by Zhordania towards becoming a more just, more equal, more democratic, more tolerant and more prosperous society — the kind of society that social democratic leaders like Karl Kautsky were keen to visit a century ago. Perhaps by 2020, the centenary of the historic visit of social democratic leaders including the future British Labour prime minister Ramsay MacDonald, Georgia will be ready to welcome yet another delegation from the democratic Left. That would be something to look forward to.